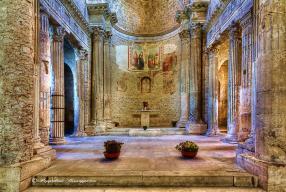 The Church of St. Salvatore, the most ancient church in Spoleto, is an interesting monument whose origins go back to the the IV - V century. The ornaments of the doors and the windows were imitated and inspired other constructions in the same area, as it is the case for the Small Temple of Clitunno. This ornamental style became chracteristic of the area. Of the old and original building the facade has been maintained, with the three doors and windows characterised by remarkable decorations. At the inside, the presbytery with semicircular apse is well preserved. The columns dividing the three naves are probably the remains of a previous roman temple. Today the columns unfortunately are merged to walls built around the VIII century, when subsequently to a fire or a landslide in the basilica, some modifcations of the original structure became necessary. The Church of San Salvatore together with the Tempietto del Clitunno is a part of the serial site "The Lombards in Italy: places of power", including seven points of architectural interest, pictorial and sculptural of Lombard asrt, inscribed on the List of World Heritage 'UNESCO in June 2011.